Synopsis: 50 years after the first Godzilla was killed, a new Godzilla reemerges, and Japan builds a MechaGodzilla with the bones of the original. MechaGodzilla has been one of the most interesting opponents in the entire Godzilla canon. In all three of his iterations, he has been something so completely different. 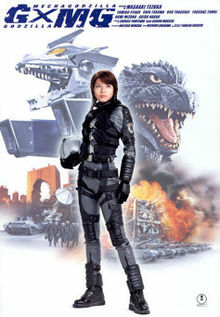 Yes, other kaiju like Ghidorah have had this, but Mecha G has been such a clear and unique shifts between each iteration. In this third and latest version of MechaGodzilla, he is not an alien machine nor is he a G-Force invention, but rather a crazy hybrid robot that all has the bones of the original 1954 Godzilla as a foundation mixed with a "DNA computer" to create this newest version. The film is very interestingly female-lead. We follow Lt. Akane Yashiro's story as she tries to find redemption within herself and her team after freezing during the initial fight against Godzilla. Yes, this is a plot point for an action movie that we've all seen before, but given the bland male characters this particular series has been plagued by, this was a welcome change of pace. This is the only movie I have seen that was dubbed instead of subbed, so it doesn't feel right to actually comment on a lot of the acting, which has never been a big highlight of the franchise in general. His tail moves, so he can hit Godzilla with it? Absolute Zero Cannon, which basically disintegrates a target to a molecular level. Needless to say, this is a jetpack version of MechaGodzilla. The movie's fight scenes are some of the slickest we've seen so far, and they don't look nearly as cheesy as the last few CGI-filled fights. Because MechaG has the bones of the old Godzilla and has a "DNA computer" at its core, it reacted wildly to the new Godzilla's roar to the point where MechaG became uncontrollable and went on a rampage. This time around, Godzilla is not the indestructible demon like he was in the last movie. While you never feel as bad for Godzilla, as say, the second MECHAGODZILLA movie, this was a really tough opponent to fight on both sides and made the fights much more compelling. Writing out the review made me realize just how bland the movie was. This new version of MechaGdozilla is amazing, and I love the idea of exploring the themes of cyborg technology, but even then, it's feels like a stretch. With the next two movies, this project will be winding down, and I really hope that FINAL WARS picks up the slack of these last few films.